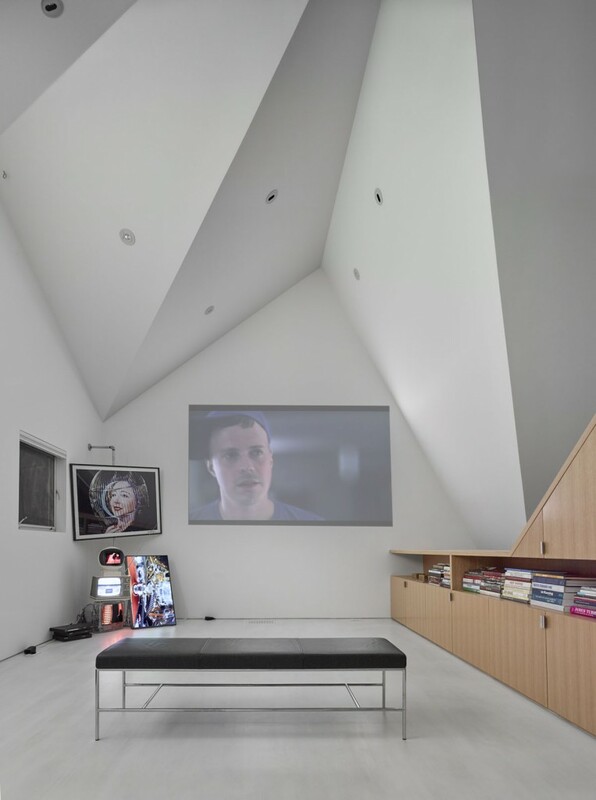 Celebrating a Client’s passion for collecting modern and video art yet supporting her needs for a functional studio and guest house, the Amoroso Studio is a truly inspired multi-functional space: part art backdrop, part guest loft, part utilitarian workroom. 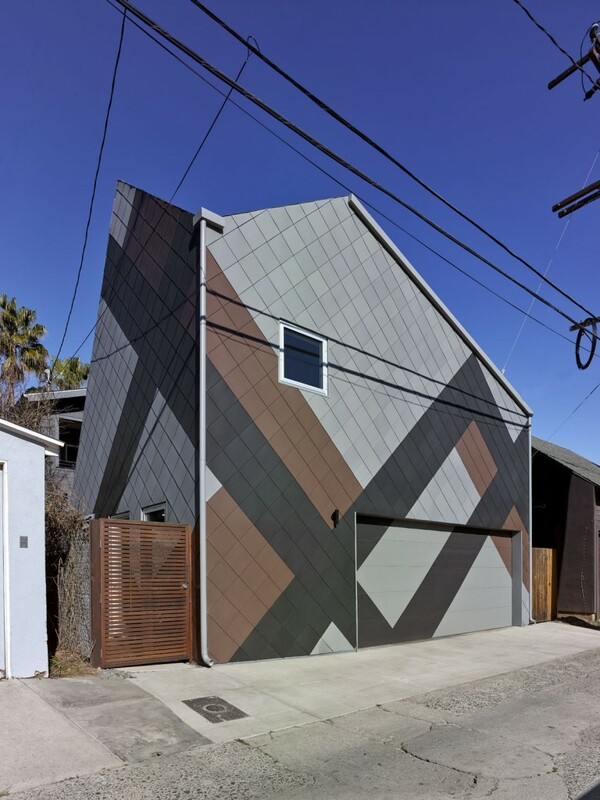 A replacement for a termite-ridden garage behind a Craftsman home in Venice Beach, CA, the design of the 1,060 square foot studio was driven by the Client’s commitment to collecting video and film based works by emerging artists who delve into gender, identity and socio-political issues. As an executive in the entertainment industry, her support of young and evolving talent began, in part, from her time living in London near the Serpentine Gallery. 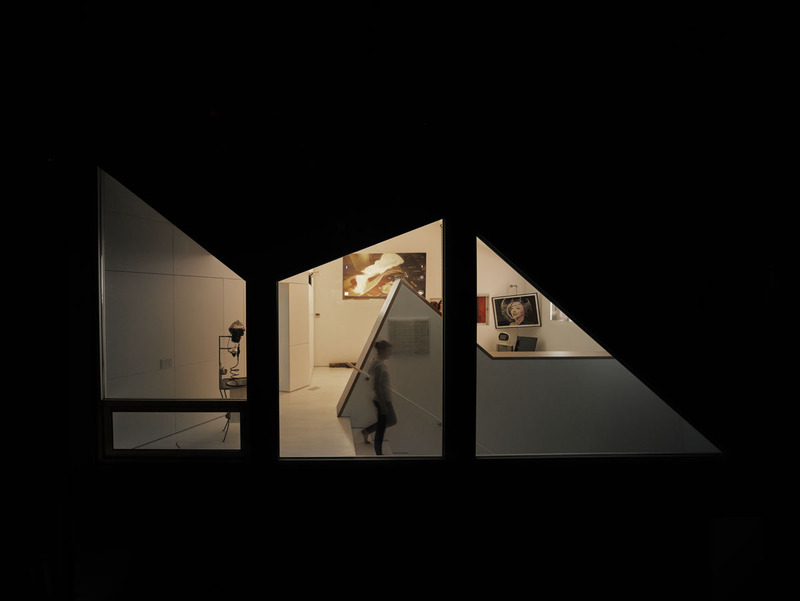 When Modal Design was brought on board the Client specifically cited the Gallery and its temporary pavilions as moments of personal delight and intrigue. 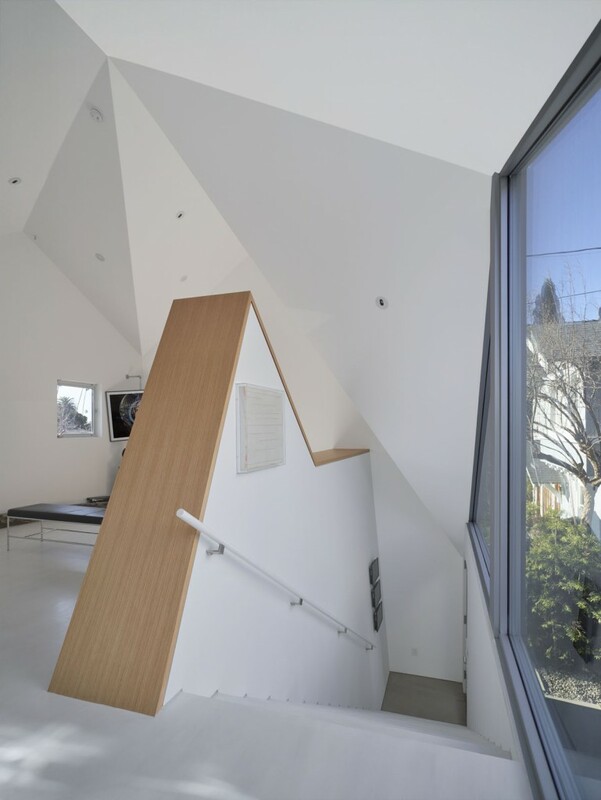 Rather than deliver a simple box containing garage and laundry space on the ground floor and a windowless projection room/guest space on the upper level, the Architect conceived a studio and art space wrapped in zinc shingles that plays off of the rooflines of neighboring homes and offers inspired spaces for projections, entertaining and visitors. The ground floor is purely utilitarian with laundry, storage and garage space. The upper floor, however, incorporates oak floors, fiberboard walls and pitched ceilings punctuated with pin lights painted entirely in white to give the space an airy feeling despite its small size. The monochromatic palette also allows the Client to project onto any surface, from floors to walls to ceiling. 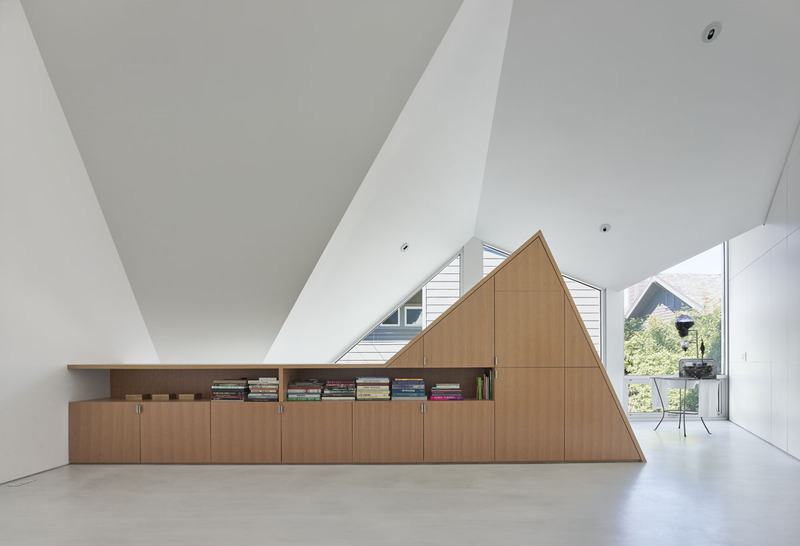 Only a custom console in natural wood stands in contrast, but offers needed display space for books and concealed space for projectors and other technology. 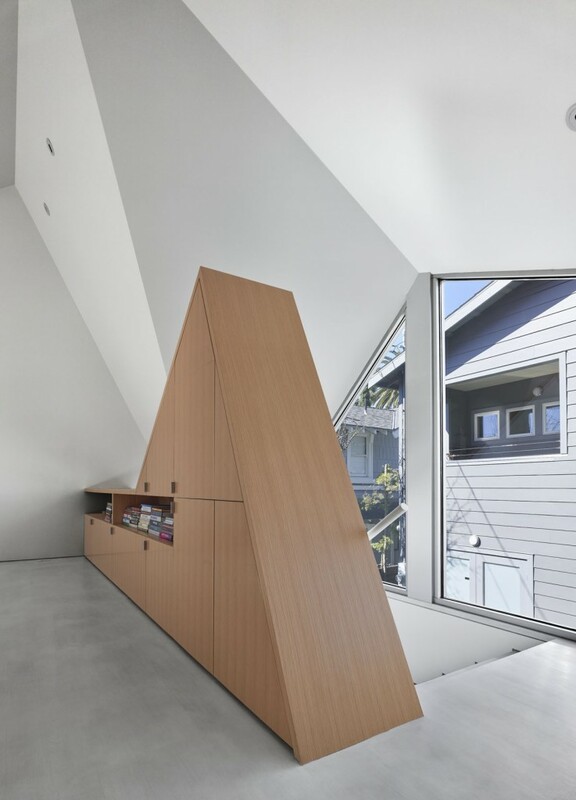 Its geometry follows the shape of the windows directly behind it, unifying the piece and the space. Hidden within paneling on a wall that separates the public space from a simple bathroom is a murphy bed for guests, storage space, closets and speakers for surround sound. From the alley the structure stands austere against an adjacent public parking lot and the harsh southwesterly sun. On the opposite side, oversized glazing allows views to and from the main house and soft light. 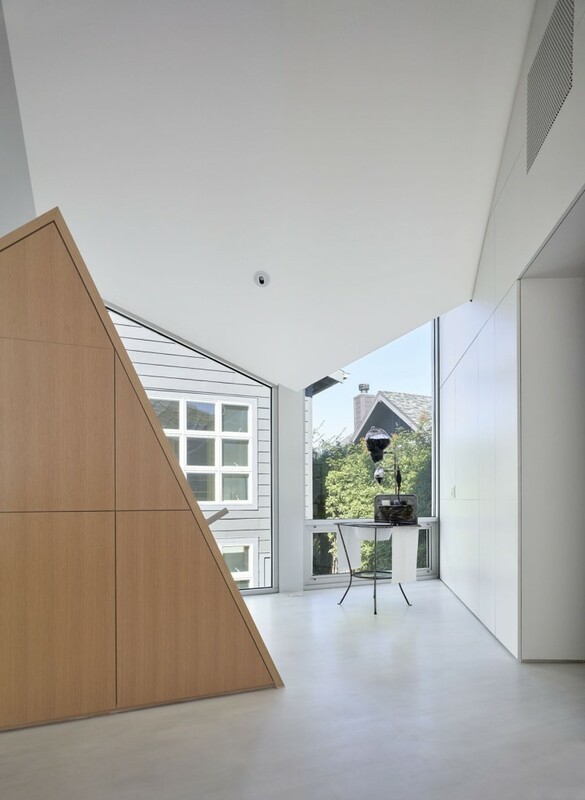 Entry from a connector courtyard between the house and studio is via a staircase that subtly widens as it leads to the main room, opening the view and feeling as you enter the elevated space. 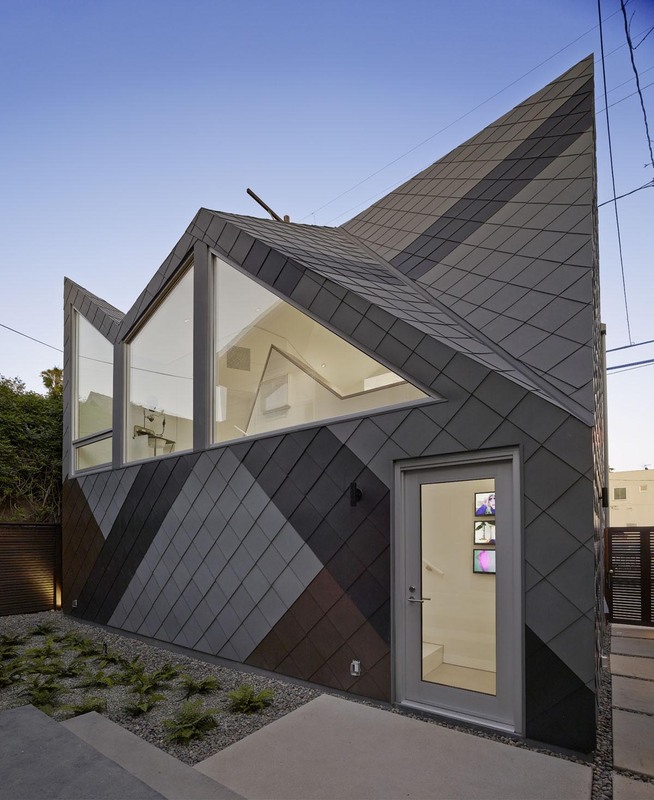 The exterior is clad in colored zinc shingles patterned in an abstract “dazzle” configuration. 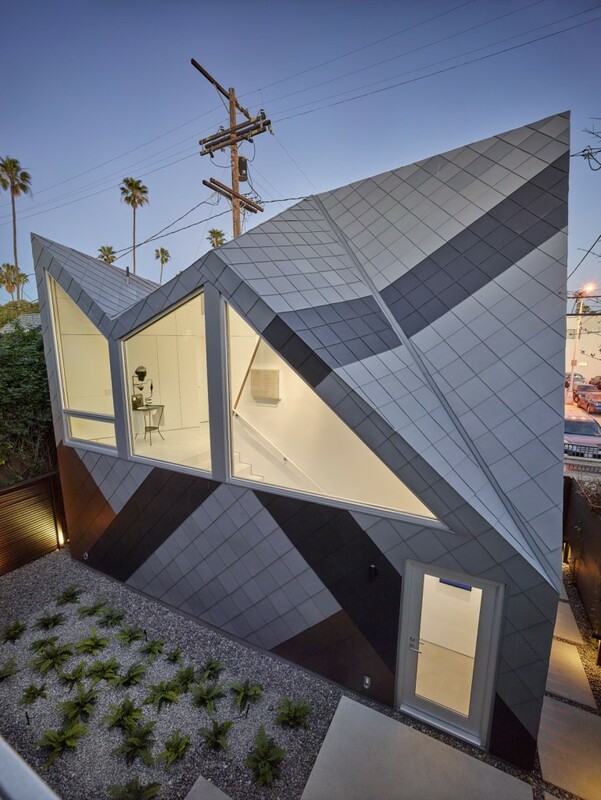 Historically done to camouflage WWII warships, the studio’s three muted colors break up the scale of the building from the alley, an adjacent parking lot and nearby Venice Boulevard.